This is another plant for the terrace, but not ground cover, obviously. When I first planted up the terrace, I included some plants lower down to help support the sides, namely willow and buddleia. Unfortunately, there was a dry spell shortly after planting, I failed to water these plants enough (at all? 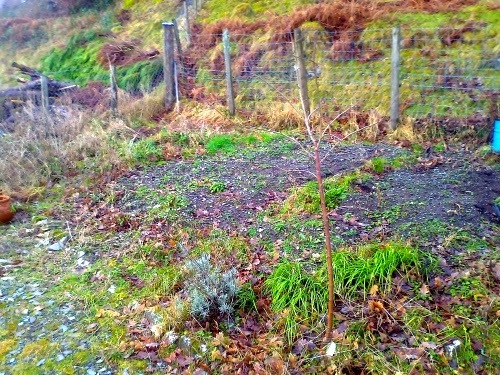 I can't remember) and most of the willow cuttings died. Last summer, I noticed a couple of saplings coming up in places where I don't want trees, and my friend Gill identified them as willow. Continuing to move soil and plants to the terrace. 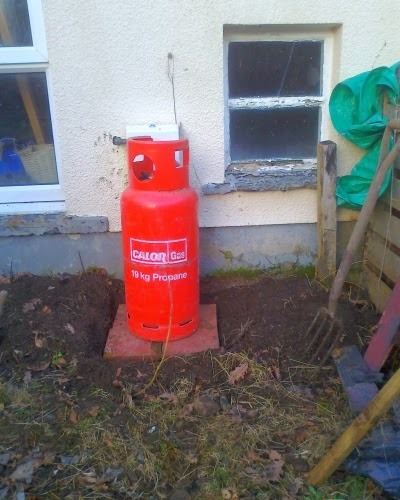 Clearing space and making a stone and tile platform for a new gas bottle, to replace the big gas tank, which is almost empty. This included moving a couple of acquilegia plants. Gas bottle sitting on its new platform. 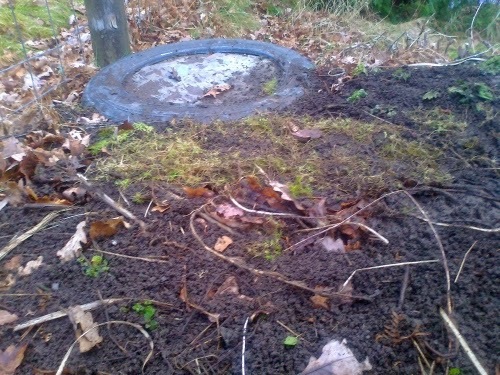 I have since lifted this and added more stones underneath, but it's still lower than the surrounding soil. Oh well, it'll have to do. Cutting back the elder tree and taking some cuttings. 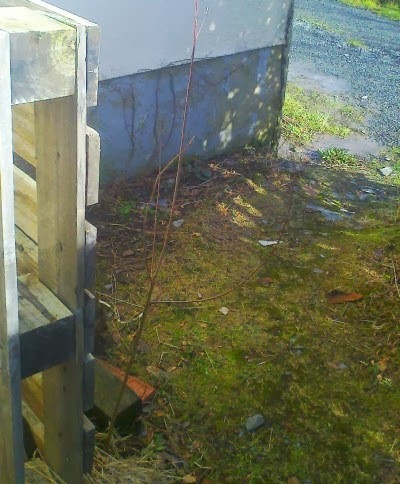 Hopefully the old tree will regrow from the stump to produce flowers and fruit that I can actually reach. Bramble reduction, and cutting back a hazel tree, both on the steep bit by the oak tree. 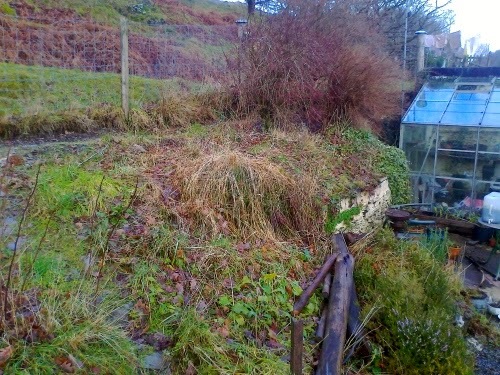 There are many more brambles still to reduce. The stormy weather led to a power cut here last night and for most of today. Whilst feeling smug that we didn't have damp down the fire (water from stove to tank doesn't require a pump, designed this way in case of power cuts), I had to concede that the heat wasn't circulating from the tank around the house very effectively without the pump. However, the hot water doesn't depend on electricity, as it's just mains water running through a coil in the hot tank. 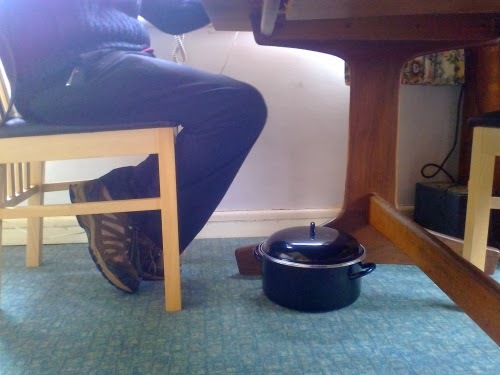 Therefore we could spread the heat around by putting hot water into lidded pots to make temporary radiators. An extra layer of clothing helped, too. My blogging challenge for this year is to do and write about some gardening each week, and I'm not expecting it to be a particularly difficult challenge. That said, the weather is keeping me indoors at the moment - the wind is making it dangerous to go out - so I'm not sure what I'm going to write about this week. Anyway, there's a much bigger challenge ahead of me: It would seem that now is the time to learn Welsh. We've lived here for over three years, now, and there's a limit to how long you can keep saying, Yes, I am going to learn, before you actually have to do something about it. Our friends next door have signed up to Welsh lessons and another friend, who is Welsh, has started a new class in which he talks about local history in both Welsh and English. This seems to be excellent practice for those who know a bit of Welsh, but at the first one I felt totally out of my depth. Rather than chickening out, which is tempting but shameful, I need to pull my finger out and learn at least a few words, so I can catch some of what he's saying in Welsh and not feel totally at sea. First, I need to stop panicking whenever someone speaks Welsh to me. To this end, I've found a couple of teach-yourself courses to have a go at. I went to the local library and searched until I found one that doesn't insist on just listening without having anything written down - it's so much easier to hear the breaks between words if you can see them written down as well - and includes some instruction in grammar, instead of insisting that it's unnecessary. The library courses were all for the southern version of Welsh, from which I conclude that this is the appropriate form round here, bang in the middle. Then I was talking to someone at a wedding on Saturday, and she said that we're in the north here. Help! I resorted to Google and, unsurprisingly, the question has been asked before. One answer was particularly helpful: I live in the North and their accent/language sounds very much like the South Wales accent to us. ... Having said this someone from, say, Carmarthen, might think it sounds more like the North. That at least explains why I'm getting conflicting information - the young woman at the wedding was from Carmarthen. I'll take my cue from the library and learn the southern version. The second course I've found is provided by the BBC. Called the Big Welsh Challenge , this course claims to teach Welsh in 12 months. This sounds optimistic to me, but I'll give it a go. It has nice little videos with subtitles available in both Welsh and English, and plenty of supporting materials. Now all I have to do is commit the time and effort to working through these courses. Maybe one day, when people are talking Welsh around me, I'll be able to follow what they're saying. Who knows, I might even be able to join in! Considering the time of year, I was surprised to find I had a choice of plants to feature this week. With a bit of brighter weather, I did some moving around of plants - various plants. However, the roses in question have not been moved, but strung up. There was a pyracantha growing against the wall in what I've now labelled Veg patch A. You can see it in the second photo of this post. It didn't contribute much to the garden, apart from providing a hiding place for bindweed roots. 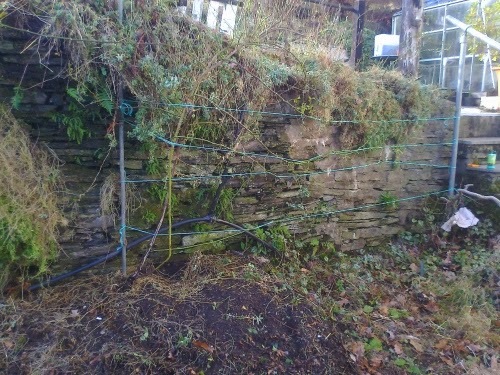 I decided to get rid of it, to increase potato-growing space, so earlier this week I did just that. The task was made slightly more difficult by the presence of roses growing through it. This wouldn't matter if I wanted to take them all out, but I like roses so I was cutting one thorny plant into small pieces while trying not to get scratched by another thorny plant that I had to avoid cutting. Once I'd got rid of the pyracantha, I was left with great long rose stalks waving about trying to catch me if I went near them. Fixing them to the wall seemed like a good idea if I wanted to regain that growing space. I went out and bought some rings for screwing into the wall, then came home and had a good look at what I had, and realised I didn't need any fixings. 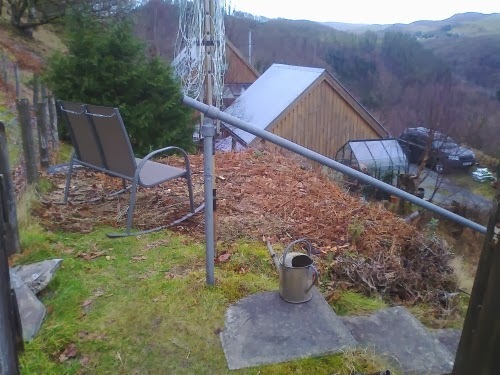 I already had two sturdy posts, one holding up a handrail and another that must have been put in for the purpose of holding up plants. They're a bit further apart than I'd ideally want, but much easier than putting up new fixings. I simply tied a few strands of indestructible string between them and wound the roses round them. The strings are most visible but I assure you, there are roses there too. I'm not sure what variety these roses are, as I've never really noticed them in amongst the pyracantha. They might be wild dog roses - I'd be quite happy with that - or they might be something more cultivated. I'll have to wait and see. Apart from the above-mentioned removal of the pyracantha, I have been mostly clearing leaves from paths this week. 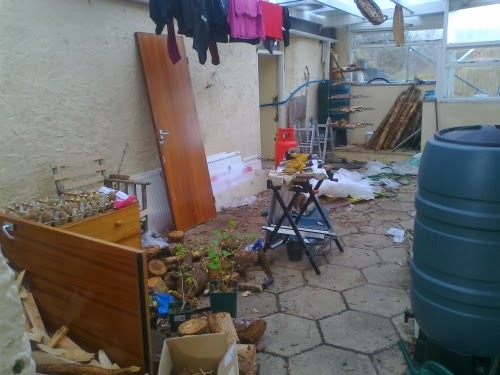 I've also done a bit of work on the terrace, moving soil and plants there. The trouble with freshly sifted soil is that it's very attractive to a cat. Not all the plants I put in are still there. As I got to the end of my foraging year, I started wondering what to do next. That challenge focused my attention on foraging to a greater degree than I expected. Whilst I'll certainly continue foraging, I could do with shifting the focus onto something else. The first year we were here, I put a lot of effort into the garden and got reasonably good returns from it - enough to reassure me that this new lifestyle is realistic. The second year, it rained a lot and I gave up. The third year, I pushed myself to do some, even if not very much, so the giving up wouldn't stick. I sowed too few peas, and no carrots or onions at all, but I got good crops of potatoes, parsnips and leeks (still going strong now). I've learnt a few things over those three years, and I now feel at home on my bit of land. I'd like to make an effort to improve my gardening this year. I've been trying to think of a blogging challenge that will support this and I'm not sure if what I've come up with will do it, but this is what I'm going to try: Last year, I ate and told you about a different wild food each week. This year, the focus is on gardening, so I'll tell you about a different cultivated plant each week. I've focused mainly on vegetables in my garden so far and I'd like to extend that to flowers, so this challenge won't be restricted to food plants, not least because I don't think I'm cultivating 52 food plants! I won't allow the same plant twice but I will allow different varieties of the same plant, though I'll try to avoid any that are too similar. The activity last year was eating; this year it will be some gardening activity relating to that plant. I could be sowing seeds, planting out (or just moving plants around), cutting back, harvesting... there may be other activities I can't think of right now. This is how I'm defining cultivated: Any plant that I do something to in order to encourage its growth in my garden, that's a cultivated plant. For my foraging challenge, I was very open about what kinds of foods could be included; not just plants but seaweed and mushrooms ended up in the list. For this year's challenge, I'm restricting the scope to plants just because I think it's unlikely that I'll be cultivating anything that isn't a plant. This does of course include trees and bushes as well as smaller plants. 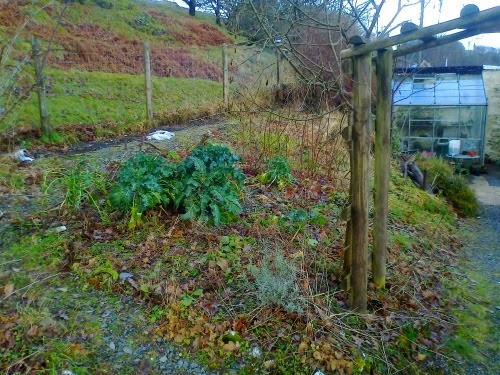 Here's a tour of the garden as it is at the moment. 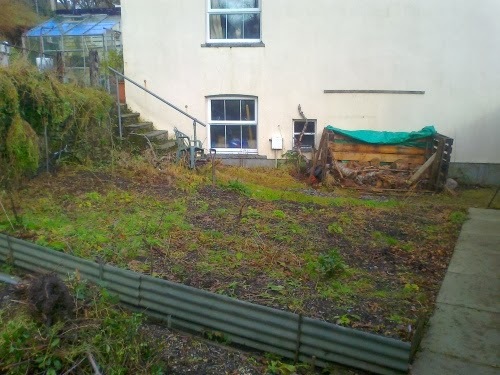 For the purpose of crop rotation, my vegetable beds are divided into three sections, which I've labelled A, B, and C. I would have four, but I grow so many potatoes that they take up one-third of the available space, so it has to be three. Two of these are large beds but the other (labelled B) consists of one medium sized bed and six small ones. Apart from potatoes, my rotation groups are, Legumes, and Other. Starting downstairs, here's the large bed nearest the house, which I'm calling A. This will have potatoes in it this year. Backing up, we can see the first three of the smaller beds, B1-B3. 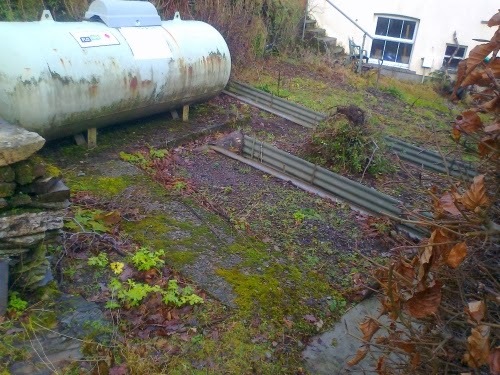 I hope to get rid of that LPG tank quite soon and replace it with a much smaller one, nearer the house. About a week ago the gauge on it dropped suddenly from 15% to zero, so we now have no idea how much gas we have left. These will probably have a different variety of bean in each, or possibly peas. The heap of stuff in the far bed was supposed to be a bonfire, but I couldn't get it to light. The near bed on the left still has some celery in it. It's very small, but tasty. Turning round to face away from the house, we see the next three small beds, B4-B6. There are still plenty of leeks in the far bed, and parsnips in the middle bed, though you can't see them. I've yet to get anything useful out of the bed on the left, or the strip at the far end. Perhaps I'll try flowers there this year. The other two will contain more beans-or-peas. 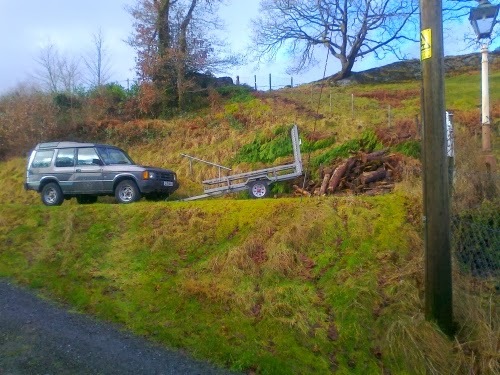 Going out of the gate and round the garden fence, there are some steep bits. These are also part of the garden, but not terraced and cultivated. 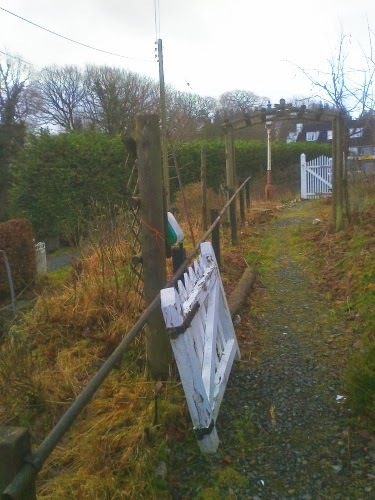 There used to be a leylandii hedge running uphill along that fence line. You can see the remains of it scattered across the hillside. I have plans for a replacement. Back within the garden fence now, at the upper level looking back towards the driveway, here is the other large veg patch, C.
There's a plum tree and a lavender bush in the foreground, and some more flowers along the edge by the path, but most of this will be for Other veg - brassicas, squash, leeks, parsnips, etc. Turning towards the house again, we come to the final B bed, the medium sized one. Currently home to broccoli, this will probably be filled with peas. Along by the fence at the top there are asparagus plants. Next to the greenhouse there's an odd bit that I haven't yet made good use of, partly because the heather and shrubs harbour many weeds amongst their roots. 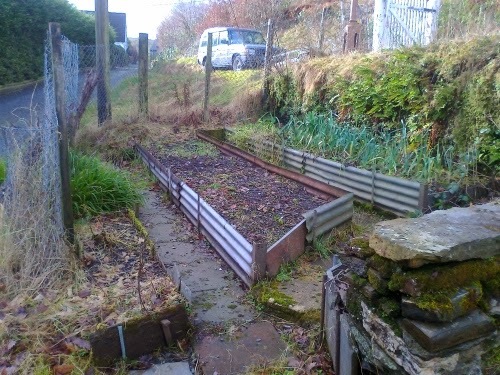 I had planned to use part of this for a herb garden. I managed to get sage, oregano and a bit of thyme established, but the slugs and the cat between them saw off everything else. I'm not sure what I'll do with it this year. 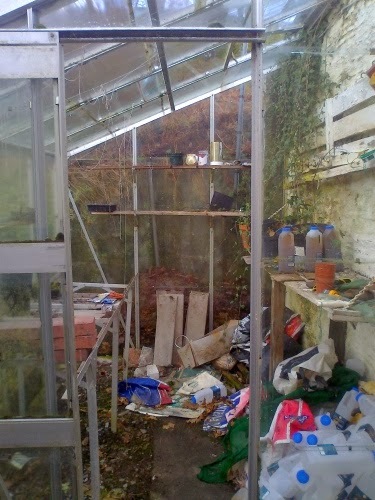 Next, of course, is the greenhouse itself. Many plants will start off in here, then make way for tomatoes. 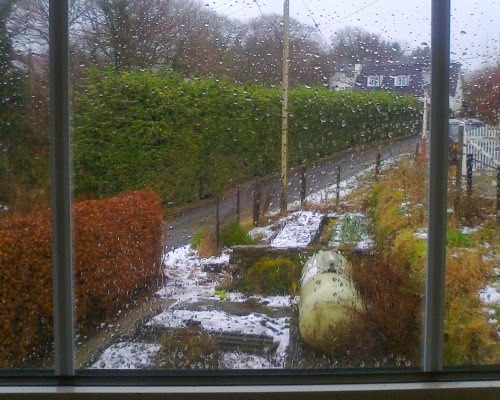 I now have the heated propagator back in there, after it spent a week being a cat bed heater for next door's cat. Looking back along the path, there's my flower border to the left. Turning back again and continuing past the greenhouse, we get to the conservatory. This is huge, but not as light as you'd think, so I'm not sure it's much good for gardening. On that chest of drawers to the left I have potatoes chitting. Finally, beyond the conservatory and up a flight of stairs, we get to my favourite place for sitting out, the terrace. As you can see, it's currently rather brown. I've set up a summary page here which will collect together links to all the weekly posts. As well as the featured plant, I'll write about what else I've been doing in the garden each week. I enjoy keeping track of what I'm harvesting as well as the preserved food and drink I'm consuming, so I'll keep the Also section of the weekly posts going.